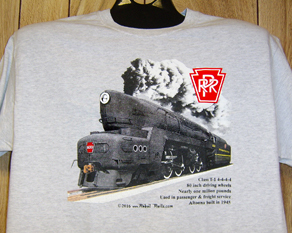 Another old favorite returns, the historic Pennsylvania Railroads Keystone logo in beautiful red and yellow on an ash/light grey 100% premium cotton tee. Possibly the Pennsys most famous steam locomotive, the K4s Class, 4-6-2 that was the workhorse of the Pennsy. This design is so authentic you just might feel the heat and smell the smoke. This locomotive is restored and operational. Patriotic scene of a Pennsylvania Railroad War Train, World War II tank and Farmer in the field, all doing their part to support the troops. Pennsylvania Railroads St. Louisian crossing a stone bridge near Horseshoe Curve near Altoona, PA.
Nostalgic scene of the Pennsylvania Railroads Broadway Limited making its way through the snow, loaded with folks heading home for the Christmas Holidays. 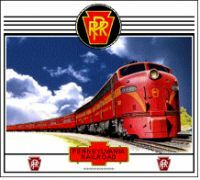 PRRs beautiful tuscan red streamlined passenger E-unit diesel in charge of the world famous Broadway Limited. 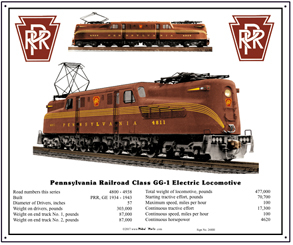 The Pennsylvania Railroads most famous locomotive, the electric GG1. 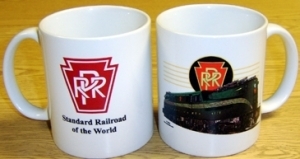 Colorful mug with a new Pennsylvania Railroad GG1 in gleaming passenger green color livery. Pennsylvania Railroads timeless K4s Class steam locomotive No 1361, known as the Horseshoe Curve locomotive as it was on static display at the curve for many years. Now restored and operational at Altoona, PA.
Coffee Mug featuring the Pennsylvania Railroads logo superimposed over the classic tuscon red paint scheme of its diesel locomotives. A very unique way to present the railroads logo. 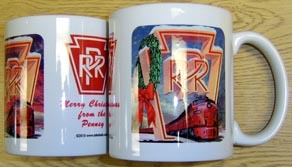 Coffee Mug featuring the newest PENNSYLVANIA RR widebody diesel in the Norfolk Southern Railroads Heritage Fleet. 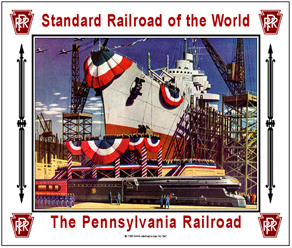 Pennsylvania Railroads timeless WWII Uncle Sam advertisement promoting Americas Industrial might with a PRR train passing through. License plate with three historic classic Pennsylvania Railroad keystone logos. Beautiful Pennsy green passenger E-unit racing the St. Louisian across the Juniata River near Altoona, PA. Pennsy operated one of the worlds largest passenger fleets. Beautiful tuscan red PRR Broadway Limited passenger train operating between Chicago and NYC. Featuring the PRRs most famous locomotive, the electric GG1 with system map in the background. 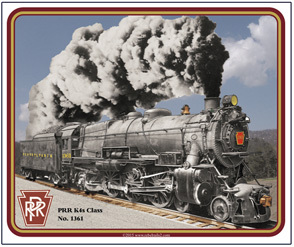 Mouse pad honoring the Pennsylvania Railroads K4s Class steamer No. 1361. 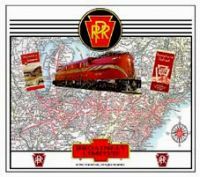 Mouse pad honoring the new Pennsylvania Railroad Heritage diesel operated by the Norfolk Southern Railroad. Pennsylvania Railroads classic T-1 steam locomotive with 4-4-4-4 wheel arrangement. Moves are afoot to build a completely new T-1. 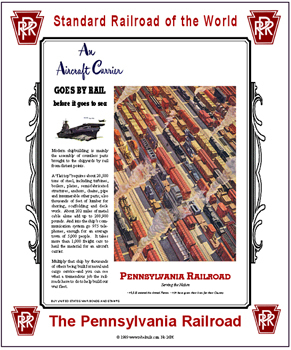 Check out www.prrt1steamlocomotivetrust.org for more information. 6 inch x 6 inch square tin logo sign of the Pennsylvania Railroads Americas Standard Railroad logo used in the late 1800s and early 1900s. 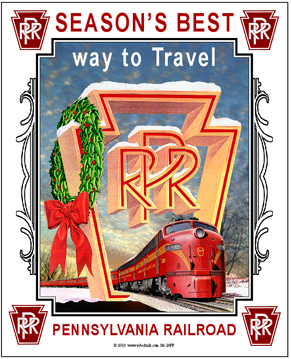 6 inch x 6 inch square tin The General Drumhead logo of the Pennsylvania Railroad. 6 inch x 6 inch square tin GG1 logo sign used by the Pennsylvania Railroad. 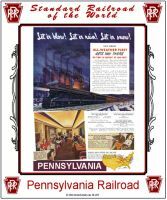 6 inch x 6 inch square tin logo sign of the Pennsylvania Railroads Jeffersonian passenger train. 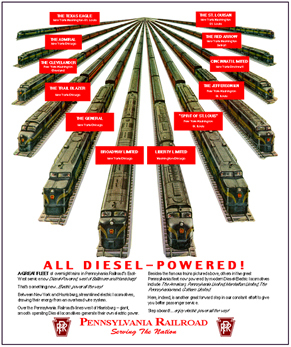 Image was used as the drumhead on the rear of the trains and in print advertising. 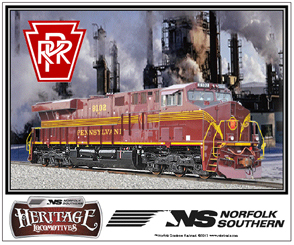 Pennsylvania RR diesel joins Norfolk Southern Railroads Historic diesel fleet. 6 inch x 6 inch square tin sign of the historic Pennsylvania RR Heritage diesel. A powerful locomotive paint scheme. 6 inch x 6 inch square tin South Wind logo sign used by the Pennsylvania and Louisville & Nashville railroads. 6 inch x 6 inch square tin Spirit of St Louis logo sign of the PRR. 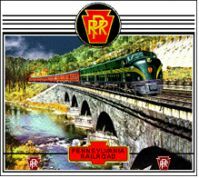 Pennsylvania Railroad passenger diesels are presented on this metal sign in beautiful PRR passenger green with yellow/gold wisker trim. Famous passenger trains are also listed on the sign. 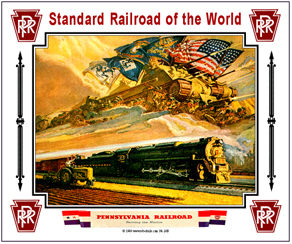 PRR was the standard railroad of the world. 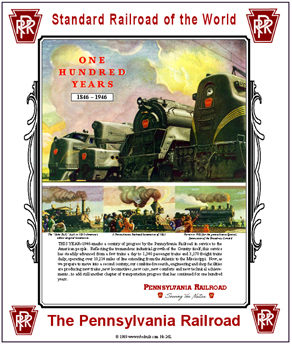 Sign depicts the 100th Anniversary of the Pennsylvania Railroad with steam diesel and electric locomotives. 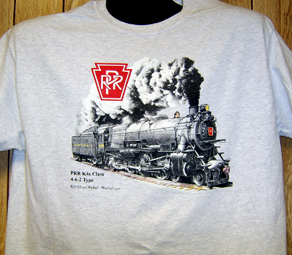 At one time the PRR was the worlds largest company. 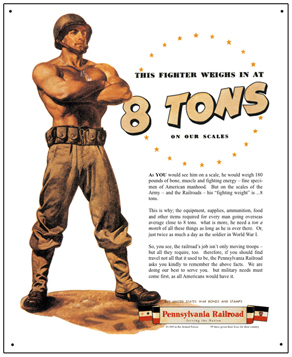 Informative advertisement ran by the Pennsylvania Railroad during World War II, reporting how many tons of equipment and supplies were moved by the PRR in support of each American soldier. Sign illustrates how a Navy Aircraft Carrier goes by rail. 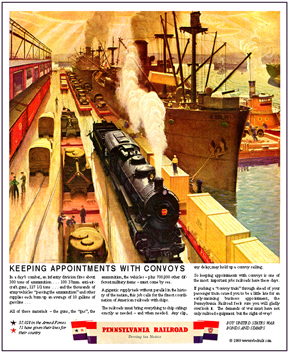 A nostalgic WWII railroad ad. 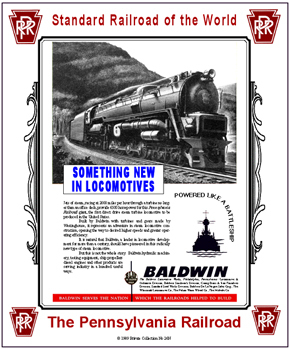 Sign depicts a new Baldwin Locomotive Class S1 that is ...built like a battle ship... A nostalgic WWII tin sign. 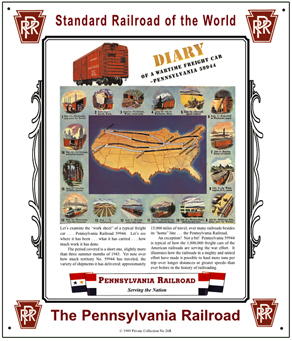 Follow a Pennsy box car on its journey across America during World War II. An interesting tin sign. 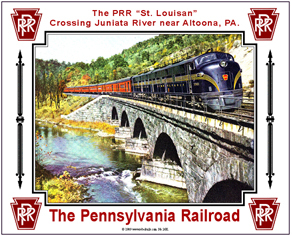 Pennsylvanias St. Louisian crossing a stone bridge near Horseshoe curve, PA, pulled by an E-unit diesel. Enhanced tin sign of a nostalgic Christmas scene from the Pennsylvania Railroad, circa early-50's. A beautiful, colorful scene of days gone by. A Pennsy coal train rolls past a coal mine during WWII. Very interesting. 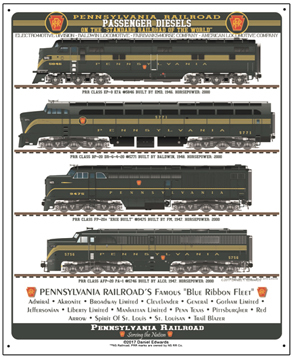 The Pennsylvania Railroads early 1950's all new line-up of diesel powered passenger trains. Represented are ALCO PA's, EMD E-units and Baldwin Centipedes. Boy what a display of power! Each train is named along with the cities it travels to. A war time scene of a Pennsy switcher on a military loading dock. 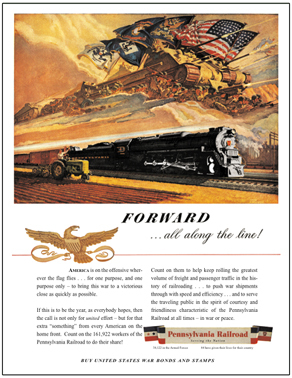 Patriotic advertisement ran by the Pennsylvania Railroad during the early years of World War II, showing how everyone is helping whether farmer, soldier or railroader. 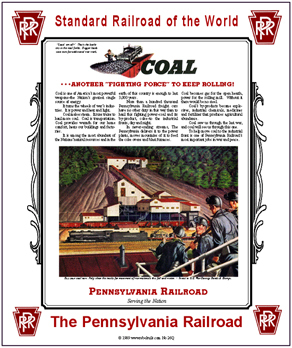 Informative metal sign featuring the famous Pennsylvania Railroads electric GG1 with factory specifications, logos and images. 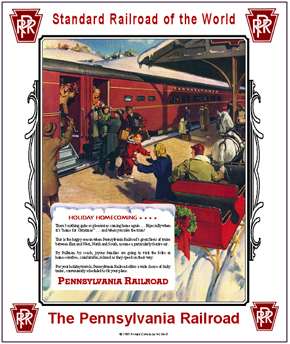 Holiday homecoming train at the local station met by friends and family for a nostalgic ...home for the holidays... time. 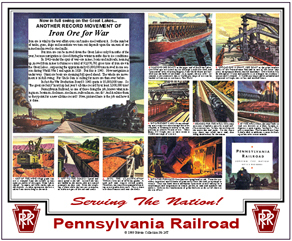 WWII patriotic story of how the Pennsylvania Railroad moves Iron Ore For War. 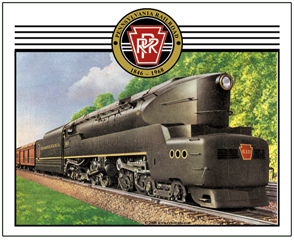 Unique tin sign of a Pennsylvania Railroad class K4s steam locomotive with several logos/drumheads used by the Pennsy over the years. 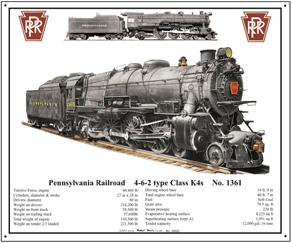 Images of the Pennsylvania Railroads K4s steam locomotive, the workhorse on the Pennsy. Contains builders specifications and PRR Logos. Let it snow, let it snow, the Pennsy will get you through. Reproduction of a World War II advertisement showing the number of trains required to move a military division and all its equipment. 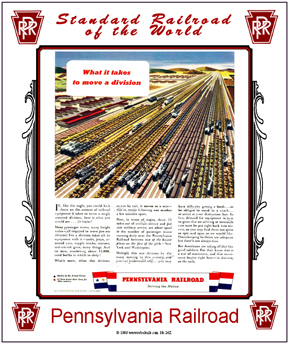 The Pennsy moved many divisions along with every American Railroad during WWII. Historic World War II patriotic scene of an official Naval ship launching with an S-1 steam locomotive standing at attention.